Following the exceptional release of Cos d’Estournel, its neighbour Chateau Montrose released below its price with a minuscule first tranche on the 17th of May. The first tranche price was £1,300 per case of six, considered as exceptional value by the market. We have now received our full second tranche allocation and can officially release it for £1,440, or £720 per case of six. In 2016, Chateau Montrose has produced a staggeringly good wine, what is already shaping up to be one of their greatest ever. It has been awarded 97-99 points from Neal Martin, stating ‘It is a disarmingly and hauntingly beautiful 2016, extremely long and the aftertaste lasting two or three minutes’. This gives it the potential to surpass the 2009 and equal the 2010 vintages, which are considered as two of the finest wines ever made in Bordeaux. The 98 point scoring 2009 trades at £2,340, the 99 scoring 2010, trades at £2,150. As such, the 2016 second tranche release trades at a 36% discount to the average price of the 2009 and 2010, making it very appealing in terms of speculation. Of 2016 Neal Martin states ‘Let’s cut to the chase: 2016 is unequivocally a great vintage in Bordeaux.’ In fact, he says, ‘Over twenty years of tasting Bordeaux from barrel at en primeur, this was my most pleasurable tasting experience alongside the 2009, albeit in a very different style.’ We posited in our report that Pauillac and St.Estephe truly exceed surpassing 2015 and Martin agrees ‘Saint Estephe played a blinder in 2016.’ As such, we can expect Montrose to score at the upper range of its barrel score, perhaps even pushing for a perfect score. The 2016 is a future hall of famer, it is a wine to own on release. Today’s second tranche release of Montrose 2016 marks an increase of £140 from the initial offering, equating to a release price of £1,440 (point A on the graph below). However, this still provides incentive to buy for investors, falling £120 below the projected release price of £1,560 (point B). 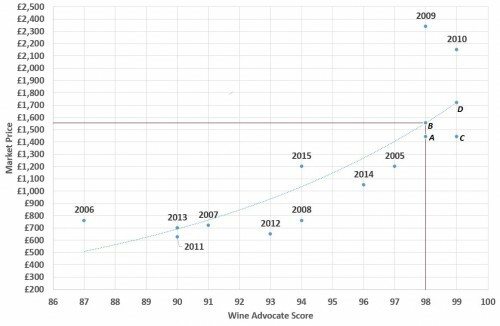 It is noteworthy that the only other 98-point scoring Montrose, the 2009, has surpassed the trend by around £800. These appreciations should amplify further if Montrose 2016 receives the upper end of its banded score. A 99-point rescore would cause an upward shift along the trendline, from point B to point D and a horizontal movement of the release price from point A to C. This would result in a projected market price of £1,720 and an anticipated appreciation of £280. The 2016 Montrose is a blend of 68% Cabernet Sauvignon, 25% Merlot and 7% Cabernet Franc (no Petit Verdot this year) picked between 23 September to 14 October and matured in 60% new oak. It has a very sophisticated bouquet with blackberry, briary, a touch of blue fruit and violets. Sometimes this Saint Estèphe can be a little broody at en primeur, but this certainly is more expressive, maintaining very fine delineation and precision, unfolding with each swirl of the glass and revealing a hidden graphite/marine influence. The palate is very fresh on the entry. The first facet of this wine that strikes you is the freshness that lasts from start to finish. This is an animated, vivacious Montrose that starts in almost understated fashion yet builds in the mouth towards what is almost a sensual finish, not a descriptor often applied to Montrose. It is a disarmingly and hauntingly beautiful 2016, extremely long and the aftertaste lasting two or three minutes. NB This is one example where I felt my second visit, over a fortnight after the first, revealed a wine with much greater potential, and I therefore raised my banded score accordingly. A solid and tight Montrose with a linear structure of ripe tannins that gives wonderful length and energy. Full-bodied, yet reserved and toned. Stone and mineral character underneath is impressive. Beautiful center palate. The class and focus are marvelous. Better than 2015. This is what Montrose is all about.